Heartland is a Seattle-based real estate advisory and investment firm with over 30 years of experience creating value for clients, including families and family-owned businesses, non-profit organizations, corporations, as well as real estate development, investment and operating companies. 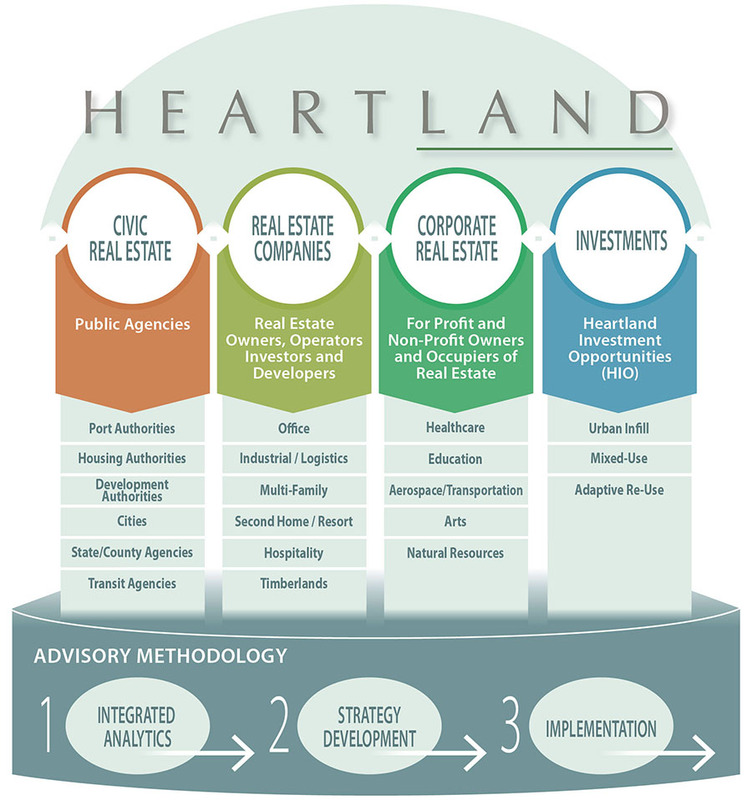 Heartland combines strategy development and analytical rigor with execution capabilities in real estate brokerage, asset management, capital markets, and development services to positively impact the communities, organizations and families with whom we work. Our practice is rooted in a deep understanding of the fundamental drivers of real estate economics. With experience across both the public and private realm, we offer a unique ability to blend the needs of the private sector owner with public sector processes and initiatives. Additionally, the expertise derived from work on our own investments and developments enhances and leverages our ability to advise others in all aspects of real estate-related activities. Heartland is unique among real estate firms, both in terms of our breadth of capabilities and our long-term, relationship-based approach to collaboration with clients and investors. This breadth in services is key to our value equation. Our scope enables us to leverage knowledge from one business line in support of another as well as provide a robust continuum of real estate services tailored to a diverse client base. Click here for more information about what we do at Heartland. Create and implement annual asset-level business plans, including but not limited to leasing strategy, capital improvement plan, etc. Oversee creation and implementation of operating budgets in coordination with third-party property management. Ensure compliance with all capital (debt and equity) and other legal documents related to the assets. Obtain and oversee insurance related to the assets and portfolio, in coordination with third-party insurance brokers and internal LNP team. Track market activity (values, rent, occupancy, absorption, sales trends) and economic trends and use it to inform asset and portfolio strategy. Perform valuations and site visits on a regular basis. Develop regular reporting tools to keep senior leadership, owner and investors updated. Perform range of financial and operating analysis. Assist internal accounting with financial performance reporting and maintain YARDI, SharePoint, and ARGUS. Anticipate, develop and recommend solutions addressing any performance issues. Execute approved solutions in coordination with property-level teams. Assist senior leadership in evaluating major decisions related to the assets (e.g. dispositions, major leases, major capital improvements, refinancing, etc.). As noted above, the position could evolve to assisting with the asset management of new investments. The essential duties and responsibilities would also evolve to reflect the broader portfolio, multiple platform relationships and potential third-party equity and debt reporting and communication. 4-6 years of experience in commercial real estate asset management which includes: accounting, finance, underwriting, lease administration, landlord/tenant relations, and/or property management. Experience with urban and suburban office assets, urban multifamily assets and industrial assets is particularly useful. Experience in the Seattle, Portland, Salt Lake City, Denver is particularly useful. Minimum of a bachelor’s degree in finance, accounting or related subjects. Our ideal candidate(s) will have a strong compatibility with Heartland culture in terms of intellectual curiosity, team-oriented nature, problem-solving capacity, desire to learn new skills as projects demand, a focus on high-quality work product, and ability to work in a fluid, fast-paced environment. Manages property-level teams, including third-party property managers, leasing brokers, etc. Travel required to appropriately cover the assets and the market. Market appropriate; experience and skills considered, comprehensive benefits package included.